38 Degrees has built a quiz to help people understand where they stand on the main Brexit options. It only takes five minutes to do and is meant to be a tool for getting you head around the various deals. It’s been produced in partnership with the independent, impartial academic think tank The UK in a Changing Europe. Here is how it works. You answer a series of questions about different issues, including how you think our relationship with the EU and the rest of the world should work. For each question you are given four options reflecting different standpoints. (If you want to know more about an issue there’s a handy “tell me more link”). Once you’ve chosen an option you’re asked how important that issue is to you. As you make your way through the quiz, you may find that some of your answers to different questions clash with each other because they are incompatible. If that happens you’ll be asked to choose between them. 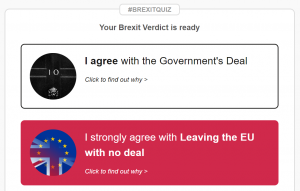 While all that is going on, in the background the quiz is rating your answers against the various possible deals (from No Deal to the Government Deal to Remain). The way each option has been rated against the deals has been checked and agreed with the academic experts at UKCE. The quiz gives you a score against each of the main possible outcomes. When you finish the quiz you will see where you stand on each of them. For instance, the quiz may tell you that you strongly agree with Remain or No Deal and would be kind of OK with the UK government deal. You can click through on each option to get an exact percentage of how you feel about each deal – and an explanation of which choices led to that. Often, your results will not be black and white, but instead reflect the complexity of the various options on the table. Sometimes that may mean that you get a result for you preferred option that is less than 100%, especially if you have said you don’t feel strongly about one of the relevant issues. Sometimes your results may surprise you, reflecting the complexity of Brexit, but if you feel you have been given the wrong result there is an option to give feedback so we can make sure the quiz is working properly.